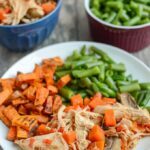 This Instant Pot Asian Chicken can also be made in a slow cooker. It’s full of flavor and easy to make. A healthy dinner the whole family will love! Place chopped veggies in the bottom of the Instant Pot (or slow cooker). For the Instant Pot, press poultry button and add 5 minutes. For a slow cooker, cook on low 6-8 hours. Use quick pressure release method, shred chicken and serve!